Oh blood oranges, how I love thee, let me cook the ways. Actually my favourite way to enjoy blood oranges are in salads. Sliced segments of ruby glory scattered amongst salad greens. It appeals to all my senses. I think by the end of the season my tribe is probably sick of seeing slices through salads that accompany dinner. Therefore I do tend to use them in other ways as well. Blood orange marmalade is a seasonal favourite. Most other uses are experimental to see what I can create. Originally the oranges in this cake were purchased and destined to be transformed into marmalade. That was until I had a craving for cake. I rummaged through the pantry to discover what forgotten ingredients were lurking. Dived into my recipes and pulled out some tried and tested ones. Taking ideas and elements from a few, my flourless blood orange and chocolate cake was born. The cake is fragrant, rich and moist. Moist from the oranges, rich due to the chocolate. I used a combination of almond meal and ground almonds. I love the texture that this created (plus it is what I had in the cupboard). You could just use almond meal if you prefer. It did seem a slight shame to use the blood oranges in this manner, as you don’t appreciate their ruby red glory. Even though the main ingredient of the cake is blood oranges, I still wanted to show off this beautiful citrus. The decision was made to top the cake with syrupy orange slices. Making sure to showcase the fruit. 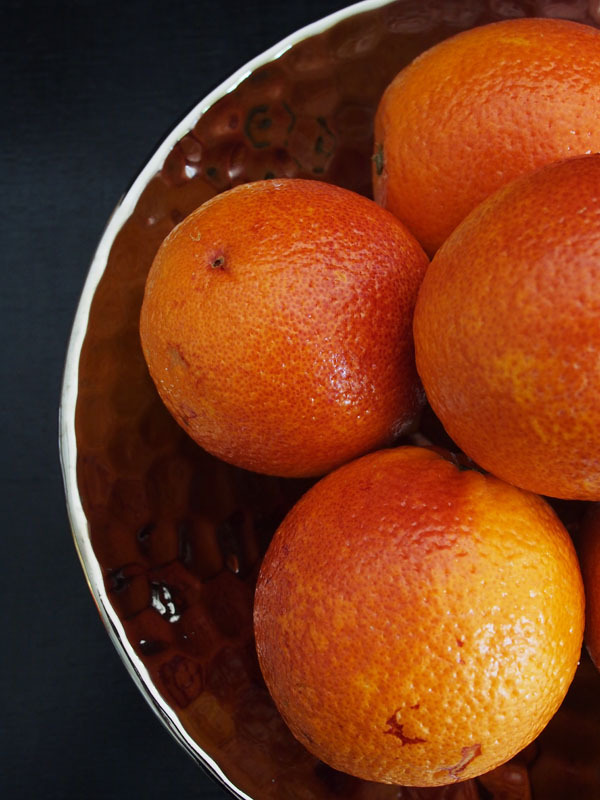 Place oranges in a heavy based saucepan (with a lid). Add enough water to cover the oranges and bring to the boil. Simmer for around 2 hours. Remove oranges from water and set aside to cool. Grease and line a 10cm deep 23cm round cake tin. Chop up oranges and remove seeds. Place oranges in a food processor and blitz until smooth. Melt chocolate, either in microwave or over a double boiler, use your preferred method. In a large bowl mix orange puree, eggs, sugar and baking powder. Mix in melted dark chocolate, then fold through almond meal and ground almonds. Bake for approximately 1 hour or until firm to touch and when tested with a skewer it comes out clean. Remove from tin and cool on a cake rack. While cake is cooling make the syrupy orange slices. In a medium heavy based saucepan place water and sugar. Over medium heat, stir until sugar has dissolved. Add orange sliced and bring to a simmer. Simmer for around 20 minutes until orange slices are tender and liquid has become a thick syrup. Top cake with orange slices and some of the syrup before serving. Do tell dear Belly Rumbles’ reader, do you look forward to a particular fruit season? What a beautiful combination. Sadly I missed the blood orange season in Oz, but there’s always next time! 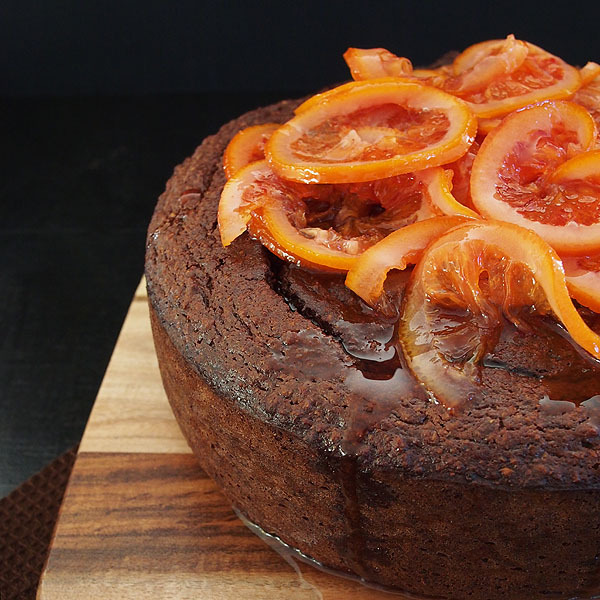 I adore blood oranges and especially in this cake! Love the chocolate and orange combo! That looks incredible. 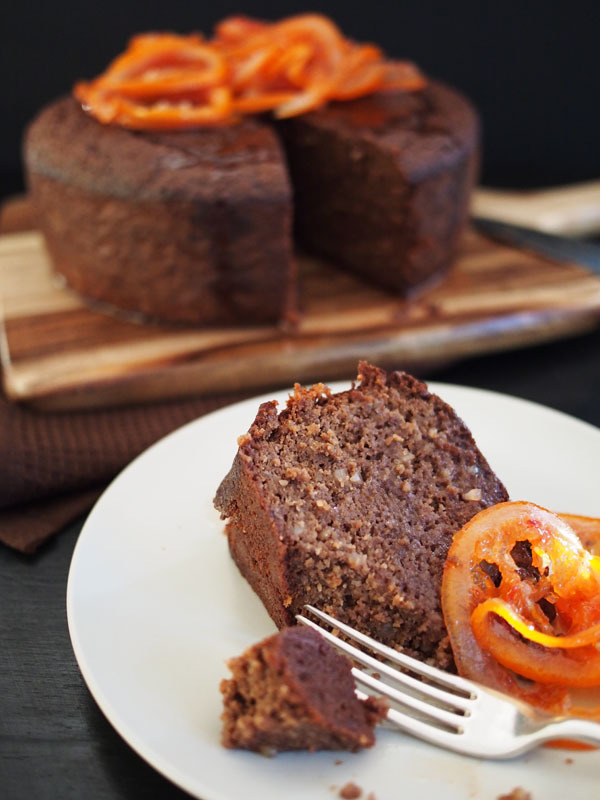 I love citrus and no one turns down chocolate cake! Gorgeous cake Sara! I don’t eat much fruit but I do get excited when I start seeing stone fruit at the markets. Having tasted said cake – I can attest to its spectacular flavour… I say “tasted” as the slice I had was commandeered by Scotty and eaten with great love. Only near the end of the slice of cake’s life did I get an “Oh, would you like to try it?”. Wow, flourless AND fruity. It looks terrific, Sara! This cake looks absolutely divine, Sara! 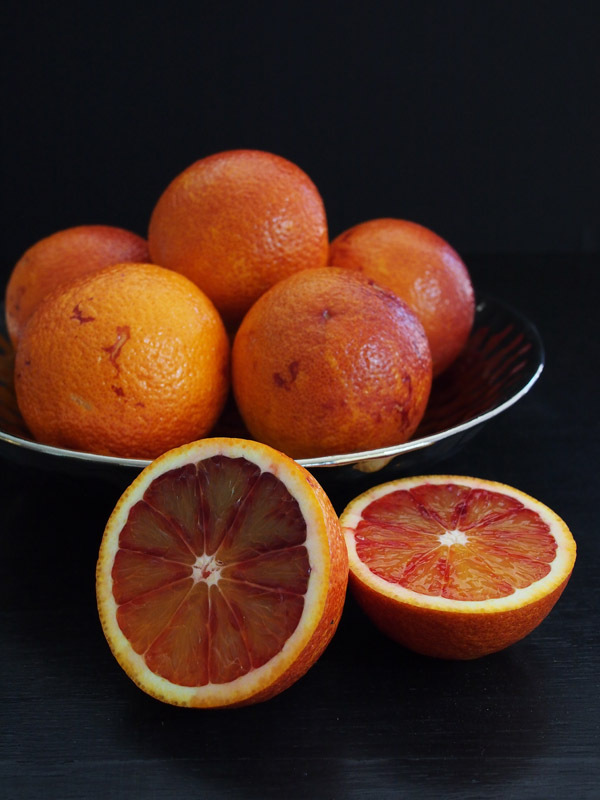 I adore the look of blood oranges, they’re such a beauty! This looks just too, too perfect. Choc orange is my favourite food combo and blood orange is so rich & lush – yum. Oh Sara i can so relate to your blood orange love! I have been making cordial, such a great colour. The cake looks delicious I’ll have to try it.